WBEZ reposted video it credited to YouTube user King-Dubb. Back in 2011, Chicago radio reporter Steve Edwards was covering gang violence and Chicago police for WBEZ when a video surfaced, showing youths menacing a suspect in the back seat of an open police squad car. Was it ethical to use that video on a WBEZ broadcast? That’s what Edwards wanted to know when he called the Ethics AdviceLine for Journalists. 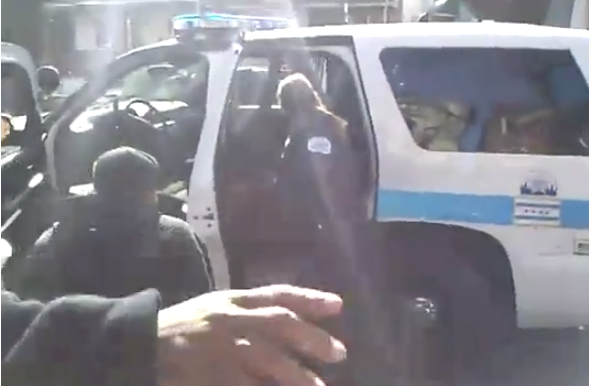 The video shows two Chicago police officers standing at the parked blue-and-white SUV with the doors open in Chicago’s violence-prone Humboldt Park area. A group of shouting young men, some possibly minors, taunt a suspect cowering in the back seat and trying to cover his face. Someone tells the photographer, possibly a gang member, “get a close-up.” The photographer posted the video on YouTube and quickly took it down. Edwards told AdviceLine that WBEZ had been investigating allegations that Chicago police had a history of subjecting gang members to harm by picking them up, then dropping them off in “enemy” gang territory. “The conduct that is alleged does not reflect the behavior and core values of the men and women of the Chicago Police Department nor our commitment to serve the community in a professional manner.” The department said its internal investigations divisions began an investigation. The Washington Post’s decision early this year to dump its ombudsman got a lot of attention, but a global growth in the ranks of ombudsmen as a step toward development has gone largely unnoticed. “This growth reflects a belief in young or fragile democracies that strong media play a critical role in development,” reports “themediaonline,” most notably in Latin America. “Themediaonline” report was based on “Giving the Public a Say: How News Ombudsmen Ensure Accountability, Build Trust and Add Value to Media Organizations” It was published by fesmedia Africa, a media project of the Friedrich-Ebert-Stiftung in Namibia, Africa. FES is a nongovernment, nonprofit foundation that promotes democratization and good governance. In Africa, according to the report, ombudsmen organizations play an important role in fending off government interference. Instead of working for news media, ombudsmen in other parts of the world might operate as voluntary associations. Africa has become a hotbed of ombudsman activity. Complaints to a press ombudsman in the Johannesburg area jumped 224 percent since 2009, according to a report at the South Africa Editors’ Forum at Umhlanga, Africa. Johan Retief, deputy press ombudsman of Print Media South Africa, said his organization received 151 complaints from aggrieved newspaper readers and newsmakers in 2009, and the tally is expected to reach 490 in 2013. PMSA is described as a nonprofit voluntary association with a membership of 700 newspapers and magazines in four languages. Greater numbers of complaints to the ombudsman organization have been laid to growing public awareness of the organization’s public advocate role and its effectiveness in dealing with complaints about inaccurate or unfair newspaper reporting, according to IOLnews. The newspaper industry’s previous system of self-regulation came under attack as “toothless,” and the governing African National Congress threatened to create a statutory tribunal to hear complaints. That was avoided by a stronger stance by the ombudsmen. For example, Press Ombudsman Retief ordered the Daily Sun newspaper to publish a front page apology for front page color photos of the bodies of people killed in mob attacks. Complainants said the pictures were insensitive, dehumanizing, inconsiderate, caused discomfort to society and lacked compassion, according to a report in the Mail & Guardian. The photos published in October and November also raised concerns that they exposed society, including children, to extreme violence and desensitized people to violent crimes. News media were divided on whether the the 911 audio recordings in the Newtown, Conn. shootings a year ago that left 26 dead were newsworthy. That might say something about the ethical sophistication with which the media are judging the news. Adam Lanza, 20, went to the Sandy Hook Elementary School on December 14, 2012, and fatally shot 20 children and six educators before killing himself. Earlier, Lanza had killed his mother at home. A year after the shootings, a Connecticut judge ruled that the 911 audio recordings of the event should be released. “There’s still shooting going on. Please!” said a caller, identified as Custodian Rick Thorne, who was among those who could be heard pleading for help. CNN and Fox News broadcast parts of the recordings. CBS said it would use some audio clips. ABC and NBC decided against broadcasting or posting any of the recordings. Many local residents and officials were against broadcasting the clips. These are the sort of decisions confronting news organizations at most disasters, weighing the benefit and harm of reporting details, sights and sounds. The Sandy Hook 911 phone calls reveal the voices of scared callers, a calm and efficient 911 dispatcher and shots in the background. There are no screams or voices of children. Jeffrey Toobin, CNN’s senior legal analyst, said it could be argued that the audio reports served a public service by showing how the 911 call-taker handled the calls. Most of the callers were calm. Toobin believed the contents of the tapes were not as disturbing as the event they represented. The shootings also were a major event in U.S. history, coming at a time when Congress was considering gun-control measures. Some local residents always are likely to see what the media do as intrusive. Eventually, the reporters do leave. Seldom is any thought given to the emotional toll they take with them after seeing the slaughter of children.